New Delhi: Muslims were “selectively targeted” in the wake of the 26 January communal clashes in Uttar Pradesh’s Kasganj and the police probe into the violence was “grossly compromised”, a report prepared by civil rights activists has alleged. The report — Truth of Kasganj — released on Wednesday also alleged that there were “inconsistencies” in the police’s version of the violence, as documented in the two FIRs, and there were attempts to protect certain people. The activists also demanded a “high-level inquiry” into the clashes. Former IPS officer SR Darapuri, civil rights activist Teesta Setalvad, Magsaysay awardee Sandeep Pandey, lawyer Shoaib Mohammad and academician Apoorvanand released the report, which is based on a study of the police reports, first-person accounts of affected people, and on-ground visit. 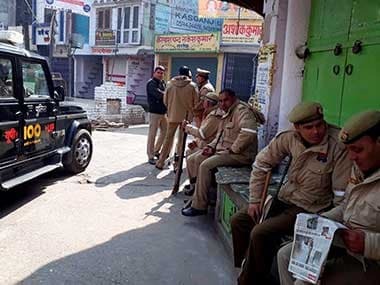 Communal clashes had broken out in the western Uttar Pradesh town after stones were pelted on a ‘Tiranga Yatra’ taken out to celebrate the Republic Day. The police had said some people were riding motorcycles carrying the tricolour and were chanting Vande Mataram and Bharat Mata Ki Jai. When they reached a minority community-dominated locality, some “anti-social elements” pelted stones and opened fire. In this firing, a man called Chandan was killed and two others were injured. The activists concurred with the findings of the report that “Muslims were selectively targeted in the wake of the communal clashes”. They also alleged that there was “discriminatory delivery of justice” to favour and protect certain people, based on a “majoritarian agenda”. The report has been endorsed by a number of civil society groups from India and abroad — Alliance for Justice and Accountability, New York; Citizens for Justice and Peace, Mumbai; Indian American Muslim Council, Washington DC; Peoples’ Union for Civil Liberties, New Delhi; Rihaee Manch, Lucknow; South Asia Solidarity Group, London, and United Against Hate, New Delhi, said Ajit Sahi, who worked on the report. The police investigation into the violence has been “grossly compromised in a blatant attempt to protect the Hindus and frame the Muslims”, the 21-page report alleged, adding, the administration and police “failed” in preventing the violence. “As enunciated in the report, we demand from the Uttar Pradesh government to terminate the current ‘tainted prosecution’ of the two charge-sheets, and constitute a high-level official inquiry into the administrative and police failure in preventing the violence and its escalation once the police reached the spot,” Setalvad said. The activists also pledged to move the Allahabad High Court through a PIL, seeking a fresh police investigation directly reporting to and monitored by the court. They also sought action against the alleged right-wing people from the motorcycle rally and investigation into their “role” in the violence. Some of the activists also wore a black armband. Sahi, a journalist, said he visited Kasganj for about two weeks to investigate it. “I later shared my findings with other activists who have worked in Kasganj after violence. They then gave their feedback and inputs, to make the report more robust,” he said. Darapuri, a retired IG, alleged “many inconsistencies” and “distortions” in the police probe. “There are contradictions in the police reports, and I can tell it because I have served for 30 years in this profession. In fact, some parts appear even foolish, and that so because they were added deliberately in the report, to selectively target and implicate the Muslims to the maximum,” he alleged. The report has also picked several other “holes in the police probe”, including, “wrong timing of starting of the scuffle, place where the clashes began, incorrect distance of the crime scene from the police station and the delay in filing of an FIR, 12 hours after the violence”. Supreme Court lawyer Prashant Bhushan, who was also scheduled to attend the event, could not, due to professional engagement, the organisers said. Former JNU leader Umar Khalid, was also one of the panelists, left the venue before the programme could begin.